I grew up on the west side of Springfield, Missouri. If you look on the left part of Springfield’s gridded streets you will find the map of my childhood. It’s where I rode my bike, learned to drive, and fell in love. It’s the place where on Tuesday, according to police, a man named Craig Wood—a public school employee—kidnapped Hailey Owens. Witnesses say Wood yanked her off a neighborhood street, drove her to his house, and shot her in the base of the skull. 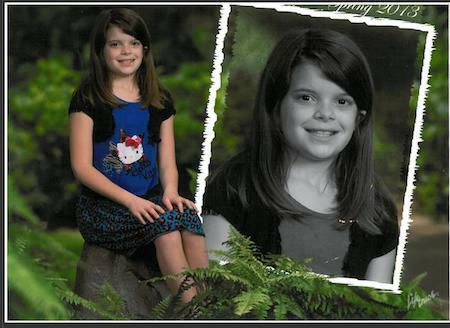 Hailey Owens was ten years old and she lived less than ten minutes away from my childhood home. The crime and its impact are the kind of things we, as a society, call “unimaginable.” For parents like me, a random kidnapping and murder of a child is the one thing we cannot bare to consider. My hometown—though large and spread out across a big county—is suffering a kind of collective grief I’ve never seen. The crime has left an entire community mourning and helpless to do anything about it. My late father had an answer that I learned just in time. I don’t know how he came about it, but I feel like it’s because he had seen some of the worst of the world. I don’t know, nor do I really want to. For the past 48 hours, I’ve been thinking about my dad’s advice. I’ve been thinking about the west side of Springfield, that sweet little girl, and what happened to her. We call it unimaginable, but that’s not quite right. People my age have been imagining it as long as we can remember. In the summer of 1981, I was seven years old. Everybody I didn’t know was a monster who crept out of Hollywood, Florida and spread out like a virus of fear across the country. Every man with a “different” face was the creature that took six-year-old Adam Walsh and left him in a way a boy shouldn’t be left. Back then, one only needed to say the name “Adam” to make any parent’s heart stop for half a second. That monster went everywhere. He made sure kids’ faces ended up on the sides of milk cartons. There was no forgetting he existed. What we called unimaginable was actually a part of our collective imaginations every time we rode our bike a little too far from the house. When a van parked at the end of our neighborhood road and the man inside called for my friend to come closer, the fear could’ve lit the whole neighborhood. Everybody was supposed to be afraid when I was a kid. It was part of the culture. The President told us the Russians wanted to kill us. The First Lady told us drugs wanted to kill us. Our milk told us somebody was killing us. And yet, we played, we ran, we stayed out until dusk, and we defied the monsters in the only way we knew how. We ran sweat lines through the dirt on our faces, and we pretended our mothers weren’t scared. Our parents pretended they weren’t afraid, and somehow we all survived. Apparently, there weren’t enough monsters to get us all. Living through it without losing any friends to the monster was a blessing, but it also numbed the part of my brain that kept watch. Surviving the years of fear was enough for a man of my generation to forget that the monsters were still out there. I couldn’t figure out why Janice was crying. I barely knew her. I’d worked at the TV station for just eight days. She was one of my new bosses. Now, on a beautiful 80-degree day in April of 1999, Janice was in tears at her desk. For the better part of the next few weeks, the story of the Columbine High School massacre would dominate our news. It would affect me as it would affect anybody, but in those days, Janice’s tears made no real sense. Columbine was halfway across the country. It was an admittedly terrible story, but Janice was a professional who had seen and heard enough death that more tragedy shouldn’t mean breaking down in the middle of the newsroom. I would learn that it was not Janice’s failing, but her humanity, one that I lacked. I was 25 years old and unmarried. My then-fiancée and I had a couple responsibilities: the rent money and the care of a 13-pound mutt. We didn’t cry. It simply didn’t touch us. Two years later, I stood outside on a March morning. It was 30 degrees and dark, and I shivered as I looked at a nice little suburban house where a man named Michael Hiderbrand had killed his wife and two children. It was among the worst cases I ever covered. 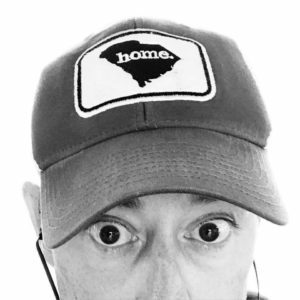 Two people I cared for deeply were within a stiff breeze of getting blown up by Hilderbrand’s improvised building-sized bomb in downtown Greer, SC. As sad as I was during the entire story, it never occurred to me to feel anything other than base-level disgust and professional responsibility. Nothing more. No matter how much hell I saw, I felt untouchable. So, imagine me in a diner. A clean one in a safe part of town where the pancakes are pretty much the best you’ll ever eat and the waitresses are the kind who consider it a profession. My son is not yet in grade school, but he knows he is among men and wants to prove it. I’m with my good friend and his son, a world-wise fourth-grader. Both of the kids need to go to the bathroom. My son wants to go with his friend, and they don’t need any help from their dads. It’s no big deal for the big kid to cross the 100 or so feet to the other side of the place. He’s done it by himself many times before. It’s no big deal. He’ll keep an eye on my boy. But as I watch my son weave through the brunch crowd, my chest tightens up and my mouth gets dry. I lose all track of what my friend is saying, and I feel sick. My eyes are on the other side of the room. I’m not hungry anymore. It’s a foreign feeling, like becoming a father has somehow triggered some hormone that makes fear real again. Too much time passes. I’m on my feet and making for the bathroom like it’s a house on fire. I know for a fact something is wrong. It’s a dad’s intuition. And of course…everything is fine. In retrospect, I probably gave my kid just enough time to find his zipper before bolting after him. It’s funny now, but funny in a way that still makes me sick to my stomach, because it was a reminder of the monster I hadn’t thought about since I was a kid. It was a monster that had been hibernating until I was old enough to understand what real fear really felt like. This week, if police are correct, that monster took the form of Craig Wood, a mandolin player in a little bluegrass band, and the type of guy no one expected to be the kind of creature he apparently turned out to be. He’s in jail now, and there is little chance he’ll see a child again. There is precious little comfort in that. When something terrible happens to a child, there is the gut reaction to fight. We look for someone bigger to blame, someone we can hurt worse than we can hurt the man we’ll lock in a cage. Sometimes the fight can take on real meaning, but in a case like this, we’re left only with a mugshot and the unsettling understanding that he is only today’s face of a fear we can’t control. That’s really the point of it. Random kidnappings are exceptionally infrequent. They are lightning strikes without a god to blame for them. They are preciously-rare reminders that we have reason to be afraid. That’s really the worst thing: despite all statistics to the contrary, we have reason to be afraid, and there is nothing we can do to change that. No amount of legislation, no focus on mental health, no Neighborhood Watch is going to change the fact that we will always have to be afraid. I look at my children—the sole reason I can live as I do—and I want to see them run. I want to see them smile because they are independent and can do things on their own. I leave them at schools. I let them run at the pool. I try to let them build their lives without building walls around them. I sit in muted terror and hope there aren’t enough monsters to get us all. Make sure your children know you love them every day. It sounds like simple advice, but in a world where we live in constant fear of what might happen, there is peace in knowing your child knows he is loved right now. Thousands of children are hearing their parents say I love you a little louder and a little more often, and that’s because of a little girl named Hailey from my hometown. Very well said. Thank you for putting into words how many of us feel. I too grew up in that neighborhood. Though I am an adult now this horrific act has brought back those childhood fears and I’m sad that my child will grow up with these terrifying memories. I have a niece, two nephews, dad, step mother and my precious son that all live in that small city. I have been so sickened by this event. What is wrong with someone that would do that to a little girl. I think that this is very well written and tells us how it is and yet, how does a community get over it? Do we teach our children and grandchildren that if you don’t know someone, they are evil? There are so many wonderful people also. I’m saddened and all I can do is pray for this family and pray for my own. I’m sure that this little girl is in Heaven and trying hard to let her family know she’s fine there in the lap of God. Well said, Brad. We still live in your childhood neighborhood and the climate is different, the children don’t run and play as freely as they once did. As we grow older, we realize how precious life is and how important it is to let those we love know it, every day. Thank you for your words, your hometown is in a state of collective grief. I currently live one block north of where this happened. It was such a shock! This article was very well written and informative. My son had a talk with my grandson,6, about people. My grandson has never met a stranger. He talks to everyone and would go with anyone. I hope after their talk, that this has changed. When his daddy told him not to talk with strangers, even if they talk with him, he said,”I don’t want to hurt their feelings, Daddy”. How do you change a child’s innocence? Thanks for sharing! As a former journalist and a girl who grew up on Springfield’s southwest side… so much of this rings true for me as well. Thank you. Yes, we all have lived with monsters, real or imagined, and will continue to do so. For awhile we will be fearful of letting our children/grandchildren out of our sight then we will become complacent again and life will return to normal, whatever that is. I had a wonderful childhood and grew up with complacent parents but I’m not sure complacency has a place in our lives any more. It should be replaced with caution. My parents never taught me to always walk with a friend- never alone, to not talk to strangers, to be careful of vans in parking lots. and the list goes on of things they did not teach me but today our children must be cautioned and taught personal safety at a very young age. I don’t like these changes in our society but change we must. I am Adam Walsh’s age and I grew up in Miami, Florida. You can bet that my first memory of a newspaper article was looking at an accompying picture of the body if water where his head was found. You can bet that as a Cuban girl in a conservative family I NEVER rode my bike around my neighbor without an adults eyeballs on me! 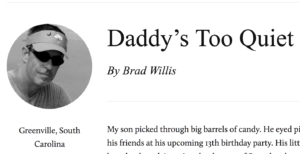 Great writing and insight, Brad. As a former school employee, I think the number of children that Craig Wood came into contact with each day further compounds the grief. Hundreds of students present and students past are reeling from the time they had spent with him. The “How did this happen” ringing in the ears and minds of thousands, if not millions. Thank you for this insight from a boy who grew up in Hailey’s hometown. God bless this little angel and her family in this horrible time ….I told some of my loved ones to watch putting pictures of their beautiful daughters on facebook. No one knows who is looking and what will happen. It wasn’t a stranger it was a teacher….I can’t imagine why this happened know where your babies are….God bless everyone. We do always need to be aware. We do NOT need to be afraid. The monsters have always been there. We prepare. Well said. It has been a rough few days in our Springfield community. Everything you said hits home for me…as we age and have more responsibilities, we notice and feel more. And yes…the past few days I have spoke a little louder when I tell my kids I love them. Making sure we have eye contact when I say it. Thank you for these thoughts. I am glad I ran acrossed it. The man was a coach and teacher’s aide, however he did not work at the school where Hailey went. He had no prior connection to her. Three of my four sons attended Westport Elem. Played in the park across the street. As a single Mom I always tried to be more aware of what they were doing..or where they were playing…I thank God every day for watching over them….and continuing to lead them as they are always aware of their children as they grow..and their parents are cautious and spend time with them . Thank you for writing this….touched my heart. My name is Lonnie and I also grew up on the west side just off scenic .When I was growing up the little girl missing was named Rose.They never found the monster but they found Rose.She had been killed and if I remember correctley it was by some lake or water.I still remember her today.She was sweet and quiet and always sported a smile.We miss you Rosie. I love your point of view on this. Very well said. I would like to also state that this tragedy has helped me to teach my daughter about people and strangers. It reminded me to always talk to her about how to protect herself. I started researching and found there are many places that offer self defense classes for young kids. They’re called anti bully and anti abduction classes. My 6 year old will be attending those a couple of times a year. I don’t agree that we have to fear in silence. We can prepare our children. It’s not a guarantee but I rather take my chances. She’ll be attending an 8 week class to teach her techniques and ways to be wise in an abduction. I won’t fear in silence. I will harness my fear and use it to do something productive and positive. God be with all those grieving. I’m Rick Clawsons mom & live just outside of Springfield. Your reflections on Hailey Owens are so beautifully done. Every one of us, that are a mother felt as though we lost our own 10 year old child this week. I can’t put into words what it has done to this area as a whole emotionally. I posted pics from the candle light service in downtown Springfield this evening-thousands were there! Maybe Rick will share so others can see. Thank You for caring so much! Very well written and said. I grew up in Chicago back when John Wayne Gacey was arrested and later we found out what he did to all those innocent little boys. I was just a little girl myself and he put the fear in me of what strangers can do. When I had girls of my own and I would talk to them about stranger danger, he was always on the back of my mind. It is so sad what happened to Hailey and I feel for her family and friends and the community. My prayers and thoughts go out to them. Its hard to teach your children about safety. Because not all “strangers” will be bad. At some point your child may get lost and will need to know which “stranger” to go to for help. I tell them its ok to talk to the workers in a store or how to recognize the customer service desk. How to find a mom with other children to go to. Kids must feel strength and courage in those situations when they need to ask for help. My prayers go with all the families of Springfield. And it’s good to know the lessons you were taught have carried through to your adulthood and parenthood. While stranger danger truly does exist, parents must be cognizant of the potential inappropriate behavior from their circle of neighbors, friends and family. I know personally this is a genuine danger zone.